1Password 7 for Windows Alpha 3 is here! We've just shipped 1Password 7.0.525 Alpha 3 now (direct link here), it includes a few nice changes such as creating/new vaults without having to have a 1Password membership. 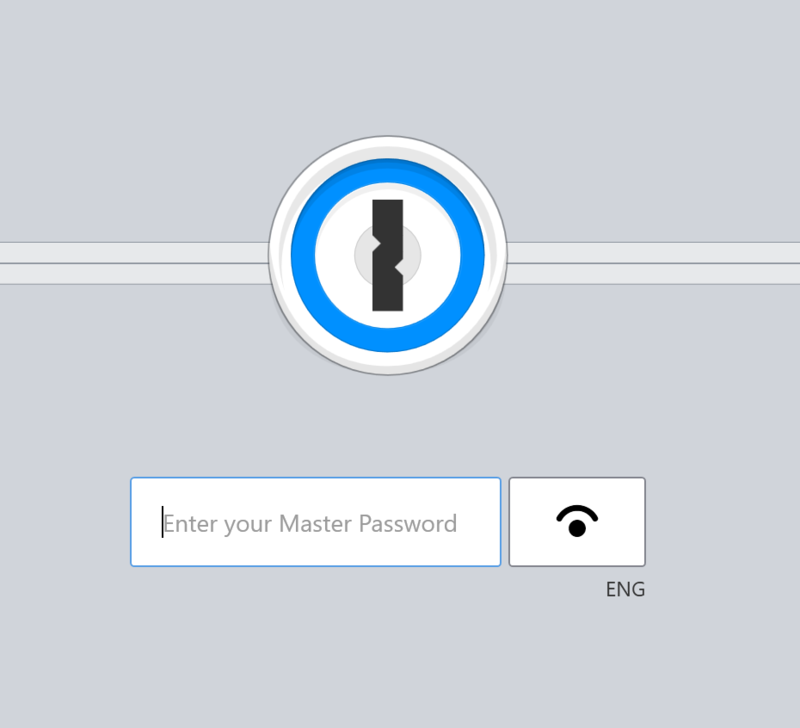 To do this, go to the 1Password menu on the initial welcome view. We will redesign the welcome view in a future beta update. In addition, check out the tags field, it now lets you auto-complete existing tags! [FIXED] The Language menu had incorrect accessibility tags as it included code labels. Link to Known Issues for this build. We've fixed the accessibility issues you've mentioned in the 1Password menu in this update, please let us know if it is working better now. @MikeT Yes, thanks, I can confirm the items being fixed! There is a different issue in the main screen, when you select an item, and tab through the fields, like user name, password, URL, OTP etc., that the screen reader often speaks "unknown", which is indeed a grouping item for the password and its buttons, or the OTP and its buttons to copy, etc., Also, it is not clear to me how you would get to these buttons via the keyboard, when you don't know the shortcuts yet. But this isn't new to alpha 3 I think. These are known issues with the item detail viewer and editor for a while, our plans are to overhaul them to simplify them and to address the accessibility issues at the same time but it will take us some time to get there. Is there going to be support for Dropbox syncing standalone vaults, or are you just going to push people into buying a 1Password subscription? We've been supporting Dropbox syncing of existing standalone vaults since the first alpha build of 1Password 7. You can open any existing 1Password vaults within the Dropbox folder and 1Password will sync as such. Enabling sync for new standalone vaults within 1Password 7 is not yet implemented but it is coming soon. The sync part is already implemented, we just need to work on creating a new OPVault sync folder that is not yet fully implemented. If you create a new OPVault in other 1Password apps and put it in Dropbox, 1Password 7 on Windows will sync it. @tomwarren Are you asking for an integration of Dropbox as a sync engine or are you asking if you can store a standalone vault in Dropbox (which sync things on it's own)? Maybe there is more behind your question but I can't really pin down where you are going with it. 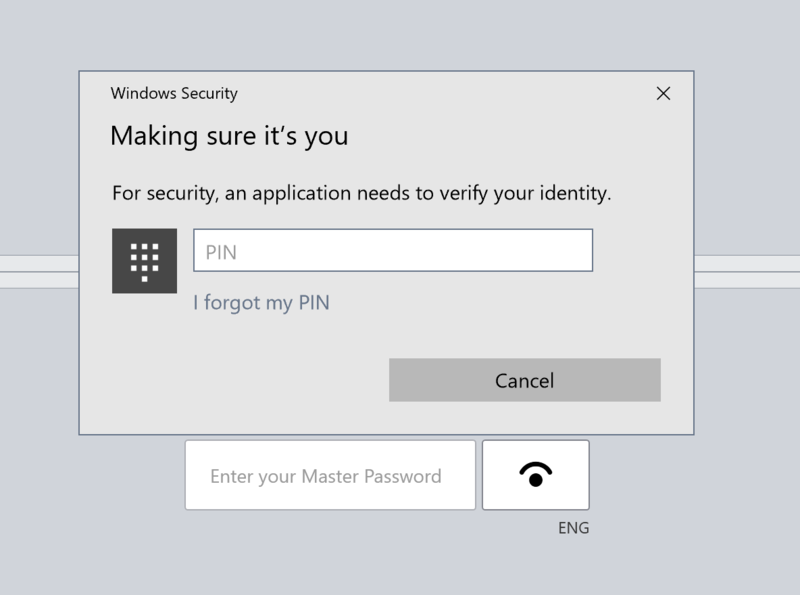 I have Windows Hello PIN set up but there is no option to enable it!?!?!? I just downloaded the software using the link above so it's the latest Alpha... Help, please? @tomwarren, Mortiz has a good point. You would need to have Dropbox installed and running on Windows to sync your 1Password vaults, there won't be a built-in Dropbox sync client in the Windows version of 1Password 7. 1Password 7 supports Folder Sync, which allows you to put the 1Password vault(s) in any folder; network drive, external, NAS, etc and 1Password will monitor that folder for changes. It'll write changes to that folder to keep it in sync with its internal database that's stored on the local drive. We plan to add more details about this to the lock view redesign later. Thanks @MikeT that worked! I didn't know that you had to unlock first using your master password. Yep, that's why we're going to add a note to the lock view once we detect Windows Hello is supported but the app has restarted (which meant the decryption key has been reset in memory) and the master password is required to re-enable Hello. It is a security measure, we don't want to store the derived key to the local disk permanently, so it is re-generated each time you start the app and unlock with your master password field. In case it may answer some questions, yes, there will be separate licenses being offered for 1Password 7 for Windows. This means 1Password 7 will replace both 1Password 4 and 6 for Windows as a single app that handles both standalone vaults and 1Password accounts, registered either by a license or 1Password membership. Note that 1Password memberships will also let you create standalone vaults, so you don't need both 1Password membership and a license together to use both. Hi, I'm sure I've seen this brought up before, but I've noticed you can't update the alpha from the 1Password menu item, when the app is locked. I'm just wondering if this is by design, or could this come in a future update? Thanks for mentioning that, it's a known bug and will be fixed soon. It's a bug in our logic related to the automatic update when 1Password is locked. If you have this enabled, you can install an update while locked but if not, it will not work. I've added it to the Known Issues section. We do apologize about that and we will improve that experience as soon as we implement the rest of OPVault support, such as the ability to view attachments/custom icons and to add new ones to OPVault. This is in progress and we do plan to add the ability to convert older AgileKeychain vaults to the OPVault format automatically when you open it in 1Password 7, as well as showing the options to enable sync for them. I'm glad Windows Hello is working for you! Windows Hello is working great indeed. Thanks @tomwarren for the Tweet about it, forgot to enable the beta's when I reinstalled my machine couple of weeks back. Thanks, @TheVMaster, that' s awesome to hear. By the way, we'd love to hear any feedback anyone has about the standalone vaults so far. While it is not fully polished and doesn't have attachments yet, we'd like to know if sync'ing is working properly, data is showing up in all 1Password apps, and so on. I have imported a vault and I see that the options for folders has been removed and my folders have been replaced with tags. Are the options for folders coming in a later update? I much prefer them to tags. @tomhoward7: We don't have any plans to add folders to 1Password.com. We intentionally went with tags because they're more flexible and work better in a group environment with shared data, which is why we built 1Password.com in the first place. Imagine if you and a team member both assign the same items to different folder structures while one of you is offline. Folders may be familiar, but they're really lacking in a lot of ways. The folder-type organization is not coming to 1Password 7 for Windows nor 1Password.com in any 1Password apps, however we do plan to make tags more useful. We'll release more details on this later when we're ready. Thanks for writing in. That's exactly what we did for the 7.0 Alpha 2 update, we've added extra icon for each scaling factor and it did work for some of us. Can you tell me what resolution and scaling factor you're using on your PC? This is a very welcome change! Thanks for all your hard work! @Stanzilla: Were you running at a higher resolution previously, so that it seems different to you now? From your screenshot, the 1Password icon looks to be about the same as the others in your notification area to my eyes. We've had some issues with Windows displaying a really fuzzy 1Password icon in the past due to display changes, and that's kind of what I expected to see based on your comments. Let me know! @burn123: I don't know that "misleading" is the right word, but it's something we can consider. It may not be ideal, but it did get you to notice that you could interact with that. I'm not sure that would be clear if we simply leave it blank. If you have any suggestions let us know! The original purpose of it was to slide out the sidebar to display the text like they usually do in a lot of UWP apps but it turns out that it is not that easy to replicate in a regular desktop program. We just haven't figured out a better icon for the moment and left it as is. We're still aiming to add this in the future when we redesign mini to be closer to the macOS version of 1Password mini. Sorry to return to basics but I'm currently running 1Password v4.6.2.626 on my Windows machines and 1Password v7.0.6 on my iOS devices. I'm using Dropbox to sync. Should I remove 1Password v4.6.2.626 before installing v7.0.525? Can I test v7.0.525 on one Windows machine while my other workstations remain on v4.6.2.626? Yes, you should uninstall 1Password 4, it will not remove your existing vaults. 1Password 7 will let you open the existing vault in the same place. 1Password 7 has an internal database, so when you open your existing vaults, it'll be imported and then it'll monitor your vaults on disk to keep it in sync. Absolutely, we use the same OPVault format for the standalone vaults, so 1Password 7 for Windows will sync with 1Password 4 for Windows, 4-6 for macOS, 4-7 for iOS, and 4-6 for Android as well. Make a copy of your vault first and 1Password 4 should already be backing up your vaults as well. So, make a copy of your 1Password backup directory from 1Password 4 as well. 1Password 7 for Windows Alpha 3 will back up an original copy of all vaults that is being opened and a change has been made, it'll keep a daily backup for 90 days. You'll see vaultname.opvault.backup.zip next to your original vault.